Every year, people around the world commemorate the Armenian Genocide on April 24, honoring the 1.5 million Armenians who were systematically murdered by those who would later inspire Adolf Hitler. 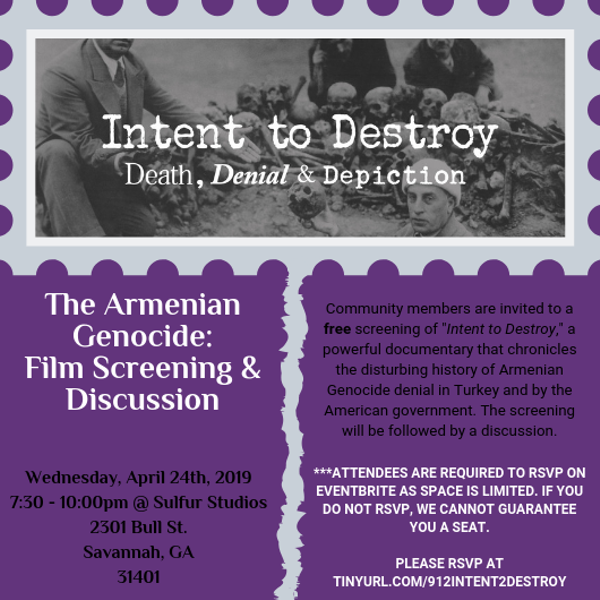 Savannah residents and community members are invited to a free screening of "Intent to Destroy," a powerful documentary that chronicles the disturbing history of Armenian Genocide denial in Turkey and by the American government, on April 24, which marks the 104th anniversary of the genocide. The screening will be followed by a discussion.